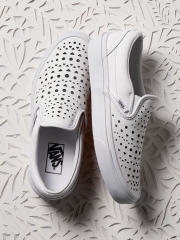 New for summer, Vans reinvents two Classic footwear styles to introduce a five-piece capsule collection of laser-cut silhouettes, made exclusively for women. Outfitted with leather, the Sk8-Hi Decon and Classic Slip-On are specially designed with a precision cut laser technology that creates unique geometric designs. The result, awesome kicks just in time for summer. 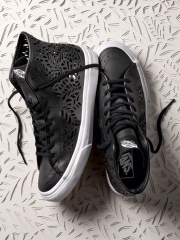 Available in black and white, the Sk8-Hi Decon’s innovative design features an all leather upper laser cut to reveal a delicate leaf print that wraps around the body of the shoe. 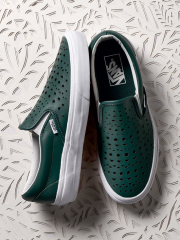 Three Classic Slip-Ons complete the offering and feature a festive pattern of cut-out geometric shapes across green gables, black and white leather uppers. Join the #vansgirls squad and click through the gallery for some of our favorites. 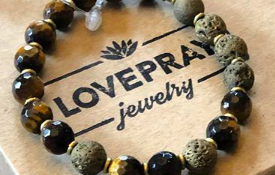 Bonus: if you click the little “i” button at the bottom of each photo, you can shop items in the story.